LD Utility Ramp The LD Utility Ramp is an efficient way to bridge the gap between the ground and smaller vehicles. 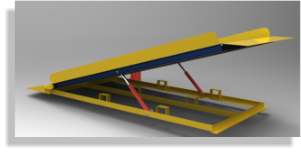 The utility ramp can be hydraulically raised and lowered by the on board hand pump. There by eliminating the need for an electircal power source. Specs: Load Capacity From 2,000 to 10,000 pounds (GVW), Ramp Dimensions 60" Wide x 144' Long up to 84" Wide x 168" Long, Incline Section 24'- 8" Long, Ramp Height Adjustable 12" to 40" and Levelling Jacks Dual Hydraulic Cylinder with Manual Pump.